Home / News / Philippines / National government ushers in the Philippines' "Golden Age of Infrastructure"
National government ushers in the Philippines' "Golden Age of Infrastructure"
“Build Build Build,” the country’s most ambitious infrastructure plan, unveils high-impact infrastructure projects of national government—perceived as among the bold solutions to traffic congestion, the high cost of prices, the demand for efficient mass transport projects, and the need for more jobs—during the first DuterteNomics Forum at the Conrad, in Pasay City. Present to discuss the Build Build Build Plan in the Forum are key implementing agencies of national government namely, the Department of Finance (DOF), the Department of Budget and Management (DBM), the National Economic Development Authority, the Department of Public Works and Highways (DPWH), Department of Transportation (DOTr), and the Bases Conversion and Development Authority (BCDA). Thirty-six of these infrastructure projects are listed in a new portal, www.build.gov.ph, which allows the public to access real-time updates on the massive infrastructure projects by DOTR, DPWH and BCDA. These projects are envisioned to increase the productive capacity of the economy, create jobs, increase incomes, and strengthen the investment climate leading to sustained inclusive growth. The DPWH, led by Sec. Mark Villar, seeks to build more roads and establish new linkages and connections. Among the biggest developments is the 8-kilometer, four lane NLEX-SLEX Connector Road which will run from C3 Road in Caloocan City to Sta. Mesa in Manila and will connect to the common alignment of Skyway Stage 3. It provides connectivity between the Ninoy Aquino International Airport (NAIA) and the Clark International Airport (CRK). It is expected to reduce travel time from SLEX to NLEX from 2 hours to just 20 minutes as well as travel time from Clark to Calamba from approximately 3 hours to 1 hour and 40 minutes. The Road is expected to benefit at least 35,000 motorists/vehicles per day. A first in the country is the 220-meter long bridge Runway Manila—the country’s first pedestrian bridge that offers convenience to commuters allowing the average person to walk the distance between the NAIA Terminal 3 and Newport City in three minutes, more or less. Currently, the travel time just to get out of NAIA T3 by road can reach over one hour, even longer on certain days. RunWay Manila is designed to accommodate up to 2,000 persons at any time, or up to 216,000 individuals per day. The bridge is for the benefit and free use of the public, particularly tourists, who may want safe and convenient alternatives to reach various parts of the metropolis. Projected to benefit 80,000 travelers per day is the NAIA Expressway Project, a four-lane elevated expressway that is expected to reduce travel time from the Entertainment City to Terminals 1 & 2 (Phase IIA), from 25 minutes to an estimated eight minutes. The project will reduce traffic congestion in the vicinity of the NAIA Terminals, and will improve the international/domestic investment environment. The project will soon connect two existing expressways, the Skyway 1 and the Cavite Expressway (CAVITEX). The DOTr, under Secretary Arthur Tugade, wants to increase the network to 2,000-kilometers and build the first rail line outside Luzon. The Mindanao Railway Project (Phase 1) is a 105-kilometer, single-track electrified rail line connecting Tagum-Davao-Digos. The rail network is seen to lower cost of goods, boost trade, and bring about genuine growth and development in Mindanao. Also listed in the portal is the Philippines’ first subway system. The Mega Manila Subway Project, a 25-kilometer underground mass transportation system running from Mindanao Avenue in Quezon City to FTI in Taguig, is expected to serve around 370,000 passengers on opening year. For its part, BCDA will build the country’s first and only smart and green metropolis dubbed New Clark City. This 9,450-hectare development within the Clark Special Economic Zone will feature mixed-use real estate developments namely for housing, a business continuity center that will house national government agencies, an agro-industrial park that will provide a platform for research and development, a food processing terminal, and the Philippine Sports City. The New Clark City will be a network of open spaces, served by public transport. It will be a long-term solution to traffic congestion in main urban centers. Another project that will increase connectivity from region to region is the new, world-class passenger terminal in Clark International Airport (CIA). With a proposed capacity of 8 million passengers, the new terminal is expected to decongest Manila-based terminals and encourage Filipinos to use the airport as a viable alternative to the NAIA. 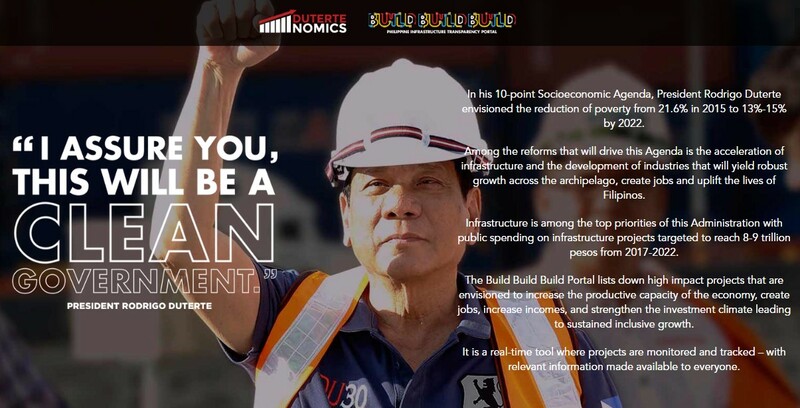 The Dutertenomics Forum offered the perfect venue to generate awareness on the Build Build Build infrastructure plan. The Forum hopes to jumpstart advocacy for President Rodrigo Duterte’s economic and development blueprint, which includes major governance, economic and fiscal policies and the comprehensive infrastructure program. High impact infra projects may viewed in the new Build Build Build Transparency Portal (www.build.gov.ph). The public may view cost, status, and pertinent documents of all the projects in the portal.